It's a case of fingers crossed that defender Dean Curry will have recovered from his knee, which kept him out of last weekend's game at Armagh City. 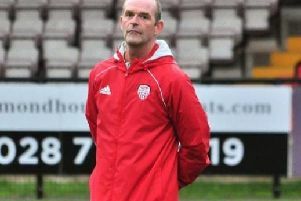 Institute boss Kevin Deery is expecting a response from his players when they face bottom side Donegal Celtic, at the Riverside Stadium (KO 3pm). The Belfast men haven’t secured a victory in the league this campaign, however they know that three points this weekend, would see them leapfrog Stute in the Championship One table. “I firmly believe and I’m telling my players going into games that they are the better team and Saturday will be different,” he said. “I’m witnessing it in games, apart from the second half at Armagh last weekend, but no disrepect to Donegal Celtic or whoever we are playing, I believe that my players can beat anyone in Championship One. Like any manager Deery continues to set mini-targets for his players and he also warns them that a win over Premier Division champions Crusaders doesn’t make them a ‘player’. “We took four points from six going into the Armagh game and we were all geared to take seven from nine, unfortunately now it’s four from nine and you are absolutely telling players that you need to be targeting seven from 12 points,” he added. “Look we would have wanted more points on the board, but if we get three on Saturday then as I said that would be seven from 12 and that would be a much better return than what we had from the first quarter of games, so that’s what I’ll be asking for and I would expect the players to be up for it. “If any of my players think they have arrived because they beat the Premier League champions then they are sadly mistaken. “After a big win over Crusaders you have to come back down to earth and go again, which we didn’t at Armagh. “Look I warned the players that anyone could raise their game to play Crusaders, it’s even harder to make sure that you are up for it for the Armagh game when there wasn’t anyone at the game, it was a dead atmosphere, you have to motivate yourself and that’s what all the good players do. Going into the game trio Dean Curry, Jamie McIntyre and Jordan Armstrong will all be aiming to come back from injury, while winger Jamie Dunne will also be looking to force his way back into the starting line-up.